Lyric Culture, the music-inspired lifestyle brand driven by the lyrics of legendary musical artists, has announced the launch of its new Jimi Hendrix men's collection, exclusively at Bloomingdale's nationwide. With input from Experience Hendrix, LLC, the family-owned company whose mission is to preserve and protect the musical legacy of Jimi Hendrix, Lyric Culture created exclusive designs featuring the lyrics to Jimi Hendrix's most celebrated songs along with imagery of the music legend, named the greatest guitar player of all time by Rolling Stone. The collection of graphic screen print tees, scarves, men's dress shirts, hoodies and cuff links (retail $48-$98) will hit the floor at Bloomingdale's stores in early November coinciding with what would have been Hendrix's 70th birthday this month. An interactive kiosk on loan from Seattle's Experience Music Project permanent Jimi Hendrix exhibit, will offer viewers in the landmark Manhattan store an opportunity to see the source of Jimi's handwritten lyrics, the inspiration behind the Lyric Culture's Hendrix collection. Bloomingdale's 59th Street, as well as all other Bloomindale's locations, nationwide, will also offer original Jimi Hendrix recordings that have been released by Experience Hendrix through its partnership with Sony's Legacy division. Titles include "Valleys of Neptune", "Axis: Bold As Love", "Are You Experienced", "Electric Ladyland", and many others in CD and LP formats. In conjunction with Lyric Culture's 'shop in shop' launch at Bloomingdale's Manhattan flagship on 59th Street, Janie Hendrix, CEO of Experience Hendrix LLC and sister of Jim Hendrix, will be signing copies of "Jimi Hendrix: The Ultimate Lyric Book", just published by Backbeat Books on Thursday, November 8 from 6 to 8 p.m. 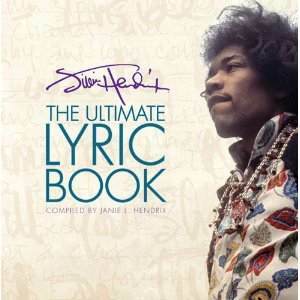 The book, which Janie compiled, contains the words to all the Hendrix classics fans have rocked along to for years as well as unpublished songs from previously undiscovered sources. This personal collection includes numerous examples of Jimi's lyrics, and photos — many never before published — accompany every song. An appearance by Billy Cox, the bassist who worked with Jimi Hendrix in concert and in the studio as part of both Jimi Hendrix Band Of Gypsys and the Jimi Hendrix Experience, will be a highlight of the November 8 session. Cox met Jimi when both were serving the U.S. Army and became fast friends thereafter, playing the southern 'chitlin' circuit' together before Hendrix departed for England on the road to stardom. Billy will be joined by guitarist Eric Gales who, along with Buddy Guy, Jonny Lang, Dweezil Zappa, Kenny Wayne Shepherd and Cox, has performed for audiences nationwide as part of the annual Experience Hendrix tribute concert tour. Gales, like Hendrix before him, is a blues-based guitarist who is left-handed and plays his instrument upside down. "We are honored to celebrate the 70th birthday of Jimi Hendrix with a new Lyric Culture men's fashion collection inspired by the fearless and innovative lyrics of one of rock music's most influential artists," said Hanna Rochelle, founder of Lyric Culture. "His legendary style and iconic music is integrated into every design. Some pieces even include Jimi's actual handwritten lyrics incorporated into the fabric prints." Following his appearing at the Bloomingdale's Lyric Culture launch, Billy Cox will remain in New York to perform at Iridium jazz club on Saturday and Sunday, November 10 and 11 with two shows per night. Billed as Billy Cox Band Of Gypsys, he'll be joined by Eric Gales, Andy Aledort and Billy Idol band veteran Steve Stevens.